Etched into the northern skyline overlooking the Lee Fields is Ireland’s longest and one of its most atmospheric buildings. The old Cork Lunatic Asylum was built in Victorian times. As part of the last set of public free historical walking tours for this season and in association with the owners of Atkins Hall, I have a new walking tour telling the story of the old Asylum and what emerged in time as Our Lady’s Hospital complex (Saturday 21 October, 12noon, meet at main gate on Lee Road). The complex closed in the late 1980s and in recent years, parts of the main grey building have now been redeveloped into apartment units. The first asylum for what contemporary Cork society deemed “insane” in Cork was founded under the Irish Gaol Act of 1787/8. The Cork Asylum was the second of its kind to be established in Ireland and was to be part of the South Infirmary on Blackrock Road. The Cork Asylum in the late 1840s lacked finance and space to develop a proper institution. A Committee of the Grand Jury of Cork County (leading landlords and magistrates) examined the existing asylum and began a verbal campaign for its replacement. In 1845, a Westminster Act was enacted to create a District Asylum in Cork for the City and County of Cork. In April 1846, a Board of Governors of the Asylum at the South Infirmary purchased and commenced work at a new site in Shanakiel. The Board set up a competition of tender for an architectural design. Mr William Atkins was appointed, with Mr Alex Deane as builder. Work commenced in mid-1848. 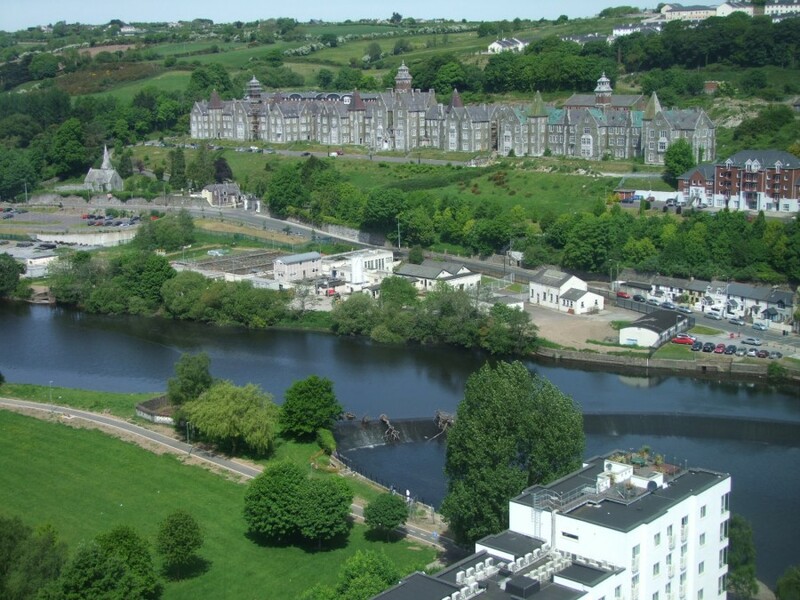 The asylum was located on a commanding location on a steep hill, overlooking the River Lee. The building was three floors high and was divided into four distinct blocks. Three blocks were located at the front and were designed to contain the apartments for patients, along with the residences for the physicians, matron and other officials of the Asylum. The building materials were reddish sandstone rubble, obtained near the site, and grey limestone quarried from sites from the opposite site of the River Lee. Internal fittings such as fireplaces were said to be of marble supplied also from the southside of the city. The fourth building block was located at the rear of the central block, and comprised the kitchen, laundry, workshops, bakehouse, boiler house and other rooms of an office nature. Heating was steam generated in a furnace house. The new Asylum was named Eglinton Lunatic Asylum after the Earl of Eglington, and was opened in 1852. The principal types of people admitted which made up the highest number comprised housewives, labouring classes, servants, and unemployed. Forty-two forms of “lunacy” were identified from causes such as mental anxiety, grief, epilepsy, death, emigration to “religious insanity”, nervous depression, want of employment and desertion of husband or wife. Plans for an extension to Eglington Asylum were put together in the 1870s. The aim was to accommodate over 1,300 patients. The three blocks were connected into a single building. In 1895, the Cork Asylum described as one of the most modern asylums in Western Europe. Conditions in the institution were deemed good by critics. Making up staff, there were 72 men and 56 women. Lectures were given to staff by lecturers of mental illness at Queen’s University College Cork now University College Cork. A Church of Ireland chapel was completed in November 1885 with William Hill as architect. In 1898, a Roman Catholic Church was designed by Hill and St Kevin’s Asylum was also constructed. In 1899, a new committee of management for the Asylum was established under the newly formed Cork County Council. In 1926, the Asylum became known as Cork District Mental Hospital. In 1952, The Hospital’s name was changed to Our Lady’s Psychiatric Hospital. 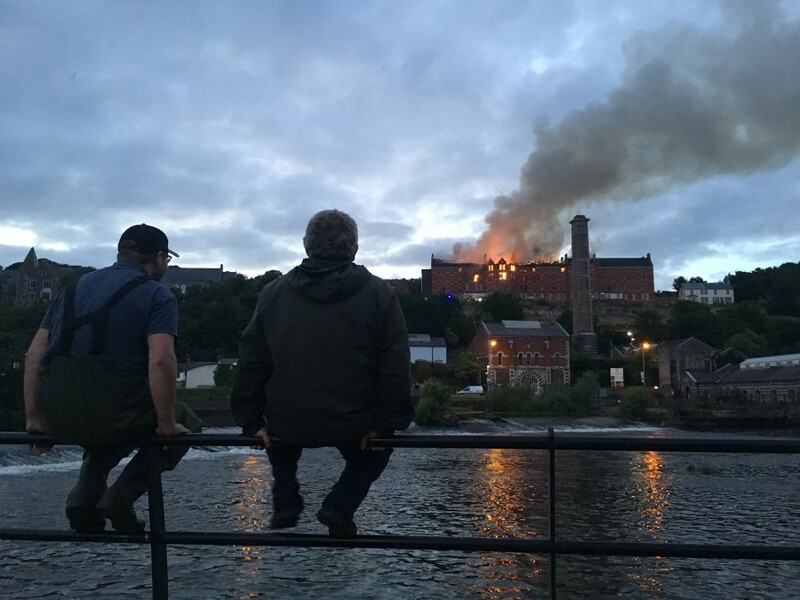 Like everyone else on Cork’s Lee Fields last July, I watched with great sadness the burning of the old St Kevin’s Asylum (built c.1895-1899) and had that deep sense of shock and loss, not just at one level but across a number of levels â€“ Yes â€“ St Kevin’s Asylum had a harrowing past but it’s future should not have played out this way. Chatting to Corkonians they expressed their sadness and frustration that a part of Cork’s social history was burning and being destroyed; they were sad to see a burnt scar of a landmark emerging on the cityscape in one of the city’s scenic spots, dismayed that it was a potential arson attack out resulting out of someone’s boredom, frustrated that campaigns over the years by resident community groups and public representatives did not gauge muster with the owners of the site, sad that the owners of the site, the HSE, did not get to pursuing a plan for the site (despite having completed some really tasteful renewal works in the old Cork workhouse at St Finbarr’s Hospital), upset for the memory and almost forgotten memory of former patients and former staff members, frustrated that in the national context, there are many other old asylum buildings that are decaying and not being utilised for a myriad of potential uses. The new walking tout is an attempt to re-awaken interest in the heritage of the site and revalorize its importance to the city. Next historical walking tour with Kieran: From Our Lady’s Hospital to Atkin’s Hall, the story of the Cork Lunatic Asylum (new tour), Saturday 21 October, meet at gates of former Our Lady’s Hospital, Lee Road, 12noon, free.